Trace fossils can reveal much to paleontologists who see them for what they are. 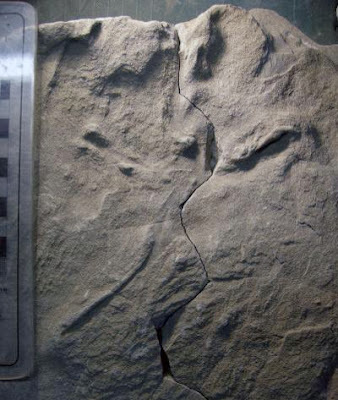 About a mark in the fluvial sandstone of Australia dating to the Early Cretaceous, Anthony Martin of Emory University remarks, "I immediately knew what it was – a flight landing track – because I've seen many similar tracks made by egrets and herons on the sandy beaches of Georgia." The rare fossil (IMAGE ABOVE) has a skidmark from the back toe of avian dinosaur dragging in the sand as it flapped its wings to come in for a soft landing. The discovery will add to the understanding of the evolution of flight In the Southern Hemisphere 105 million years ago when Gondwanaland was breaking up.